Bad Religion by Ross Douthat reviewed: Liberal politics mean less charitable giving. Don’t be afraid to criticize the wealthy and powerful, Christians. The answer is fuzzy in part because Bad Religion is a book about culture and theology, not domestic policy (that was the subject of my last book! ), and in part because I wanted to stress the fact that I don’t think there is anything like a single Christian politics. There are lines Christians can’t cross and causes they can’t support, but on most of the questions that divide us in the West today—where to set tax rates and spending levels and so forth—just saying “What would Jesus do?” doesn’t get you very far. Given that Jesus’ only explicitly political admonition was “render unto Caesar what is Caesar’s, and unto God what is God’s,” a Christian libertarian, a Christian socialist, and (for that matter) a Christian monarchist can all make a plausible claim to be living out the gospel. With that said, I think it’s entirely understandable that so many thoughtful Christians in the United States and Western Europe found themselves leaning leftward in the late 19th and early 20th centuries, citing Christian principles as a justification for an ever more comprehensive public safety net. Whether it was the Protestant Social Gospel in the United States or the role that Catholic-dominated Christian Democratic parties played in building up the postwar welfare states in Western Europe, the cruelties of industrial capitalism created a widespread sense, plausibly rooted in the New Testament worldview, that Christian societies should do everything in their power to make the largest possible public provision for the poor. And had I been alive in that period, I might have thought the same way too. 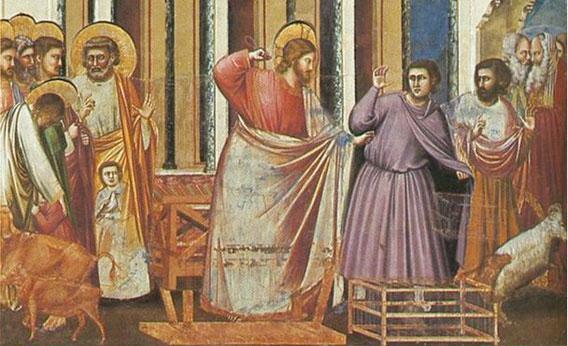 Expulsion of the Money-Changers From the Temple, painting by Giotto di Bondone (1267-1337). Finally, the point of Christianity is ultimately salvation, not a more utopian political order, and the welfare state can become a kind of idol as easily as anything else. In many cases, the more that Christian churches (in the Protestant Mainline, in particular) have focused on an updated version of the Social Gospel, the more they’ve tended to lose sight of the rest of the Christian message. These are some of the issues (joined, of course, by the Democratic Party’s drift on cultural issues) that lead me to identify more with a limited government conservatism than with Obama-era liberalism. But that doesn’t mean that I’m terribly happy with American conservatism as it actually exists. I don’t look at the Republican Party and see an idealized expression of a Christian approach to politics: I see a party that has the right general idea of what the size of government should be but then devotes far too much of its energy to serving the interests of the well-connected and well-off. I’ve tried, in my limited way, to sketch out a vision of conservatism that better reflects some of the skepticism about wealth and power that you’ve picked up on this book–that’s more friendly to working-class families, say, and more hostile to unearned privilege, and that’s focused on genuine equality of opportunity as well as economic growth alone. But I’m not under any illusions that it’s about to take the GOP by storm! Finally, I also think that Christians need to feel comfortable being critical of the wealthy even when this criticism doesn’t come with ready-made public policy implications. My sense is that many conservative religious believers are worried about saying anything remotely judgmental about, say, the depredations of Wall Street because they’re afraid of giving aid and comfort to the political left. But the Jesus of the New Testament managed to be hard on the rich and powerful without endorsing the revolutionaries and political utopians of his own day. And the same goes for Christian conservatives and libertarians today: If you don’t think the government should be responsible for cutting great fortunes down to size, that should only heighten your responsibility to issue a moral critique when rich people let greed and hubris get the better of them.